Did you know you can connect your iPad with your Twitter account? Associating your iPad with Twitter allows you to easily share pictures, websites and other tidbits to your Twitter followers without the need to go into a separate application. This can be very handy for those who are active on the social network, but before you can take advantage of it, you need to set up Twitter on your iPad. First, open the iPad's Settings. This is the icon that looks like gears in motion. Next, scroll down the left-side menu until you locate Twitter. Choosing this menu option will bring up the Twitter settings. Once you have Twitter's settings pulled up, you can log in to your Twitter account. Type your user name and password into the appropriate fields and tap Sign In. If you want to add a second account, simply tap the "Add Account" option. This will bring you to a screen prompting you to enter your user name and password. "Update Contacts" is a pretty cool feature that will add Twitter accounts to your contacts even if you don't follow them on Twitter. Don't worry, this doesn't spam your contacts with invites to Twitter, it simply uses the email address in the contact information to find the Twitter user name. You don't need to install the Twitter app to use the integration features with your iPad. In fact, you can use any one of the many different Twitter clients for the iPad instead of the official application. So what can you do now that you have them connected? The two best features of connecting your iPad to Twitter are easier tweeting and streamlining the process to post pictures to Twitter. Now that they are connected, you can tweet using Siri. Say "Tweet" followed by the status update you want to post and Siri will post it to your timeline without ever needing to open Twitter. Never used Siri? Get a quick lesson on getting started. You can also share photos directly from the Photos app. When you are viewing a photo you want to share on Twitter, tap the Share button. It's the rectangular button with an arrow coming out of it. The Share button will present a number of options for sharing the photo, including Twitter. 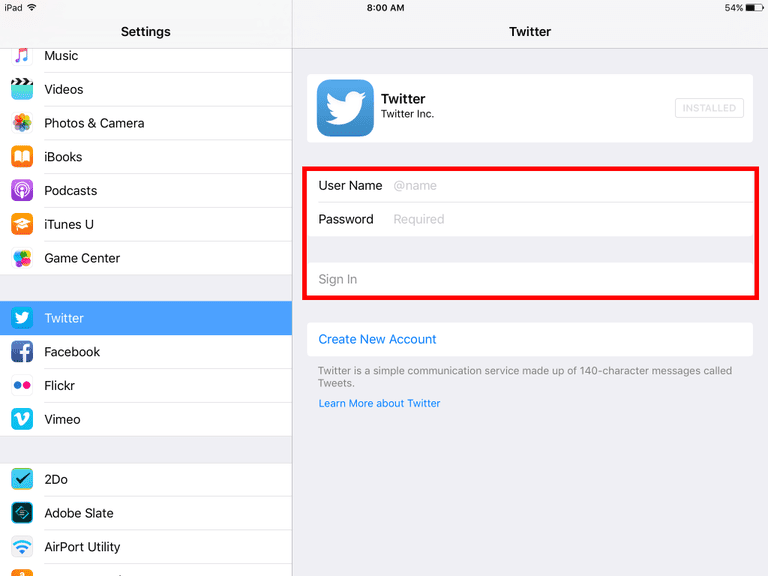 If you have your Twitter account connected to the iPad, you won't need to input your username or password.